I’ve written about caring for indoor holiday plants, and included Kalanchoe (the pretty little flowering variety called Kalanchoe beharensis) in the post. 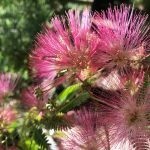 Well in Southern California those plants and a lot of the genus can be used outdoors in our gardens, so I thought I’d give you some tips for caring for them outdoors. 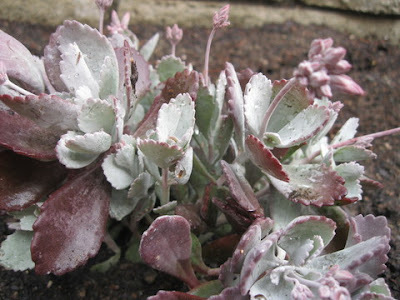 Kalanchoes that are planted outside well drained, alkaline soil. 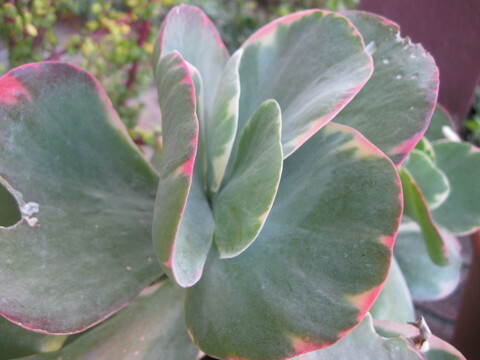 Wet and cold climates are not great for kalanchoes, so much of Southern California is perfect for them. That said, a cold snap could damage your kalanchoe, so it needs protection either from other plants or frost cloth when the temperatures go below 40. If you are worried about them in a planter bed, they are fantastic in container designs. If you put them on wheels they can be pushed into your garage or under protection when the weather gets too cool. Spacing is important – make sure you know that mature width of your plants and space them accordingly, plants that are crowded are more susceptible to problems such as leaf spot and the pests that attack the plants (notes below). They are salt tolerant, so they can be planted near the ocean (and it is more moderate there, so that is an added bonus). Kalanchoes can be planted in both the fall and the spring here in Southern California, other parts of the country should stick to spring after danger of frost has past. You should fertilize your kalanchoes once a year with a nice all-purpose (organic if possible) fertilizer. Kalanchoes are easy to propagate, many send out small plants on the edges of their leaves, which when big enough can be removed and planted in their own pots. You can also take a cutting with at least 2 leaves (more is better), let it dry out for 24 hours and place it in potting soil. Make sure to water frequently, and soon you’ll have a new baby. There are some garden pests that are a problem for Kalanchoes – slugs are number one on the list! Here is a photo of a slug attack! 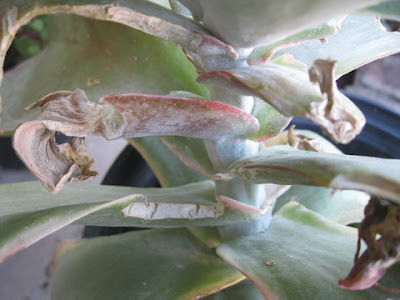 Caterpillars, aphids, and mealy bugs can be a problem look for natural pest controls, your kalanchoe and your garden will be happier for it. Now time to talk about animals… Kalanchoe is POISONOUS to both dogs and cats! So think about where (or if) you want to plant them in your garden. For a nice selection of kalanchoe, please visit my friends at Worldwide Exotics in Lake View Terrace.